Not too much info coming in from the Bonn Camp the past couple days. The team seems to be going through the practices in pretty good shape. There was one piece of news I forgot to mention previously. 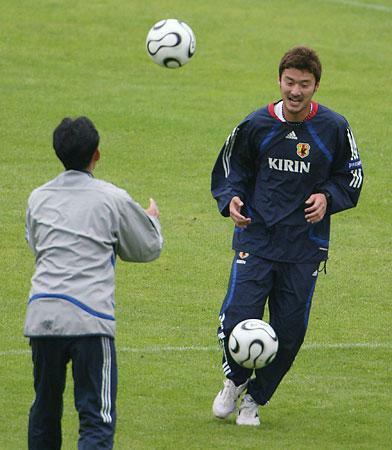 Nakamura had gone to the hospital along with Kaji after the Germany game. Apparently during the game one of the German players had stomped on his toe(s), and after the game his toes were quite swollen. Since Nakamura was back at practice the next day, I guess it wasn't too bad. The weather has been quite unstable in Bonn, with low temperatures and scattered showers and even some snowfall! The players are visibly shivering during their post-practice sessions, and what worries me is if the weather suddenly gets very hot once the WC starts -- the team won't be used to the heat. The practices have been mostly minigames of 6-vs-6 in groups of sixes, shooting practices, set piece/crosses strategy on both defense and offense. Teruyuki Moniwa safely landed in Germany on the 1st and joined the practice the next day (photo below left). Just checking in to say hello and to let you know (for those of you who were not able to watch the Germany vs Japan game) that I will post a match review on Friday night. Thanks to Otto, Nak, Akira, Sickemrex, and Ami for their comments in the previous post; and for >>posting the Video Links to highlights! I appreciate it! Makoto Tanaka has returned to Japan and was greeted at the airport by the media wanting to get a comment -- Tanaka said that he was very disappointed that he had to leave the team like this so suddenly, but that the team is in good condition and that he wants them to aim for the top in Germany. When asked about Moniwa, he replied that Moniwa has been with the team for a while now and that he should not have any trouble joining the squad. 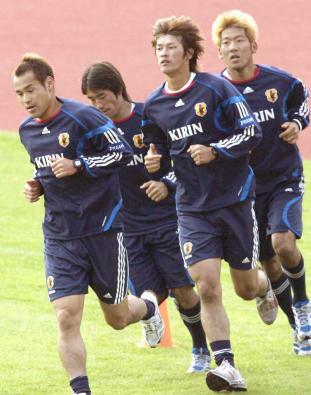 The decision for Tanaka to leave the squad was made by Zico; Zico commented that he felt that Tanaka would not be ready for World Cup play in time, and that though he was extremely sad to have to make the decision, he felt it would not be right for them to keep Tanaka given he would not be at 100% in time for the World Cup. Teruyuki Moniwa was in Hawaii with his family when he got the call-up. Moniwa immediately flew back to the Japan and is hopping on a flight to Germany today. FIFA will officially recognize the player change after the doctor's report on Makoto Tanaka has been reviewed and confirmed. Hopefully there won't be any trouble there. Moniwa was extremely disappointed when he found out that he did not make the squad during the first announcement of the team; but he is revved to go now. I don't know at what type of fitness level he is right now, and his major concerns will include both improving fitness and getting a clear understanding of the team's defensive strategies. 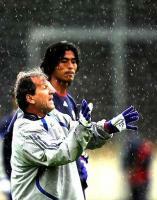 The day after the game against Germany, Zico and his men were back at practice. Those who started in the game sat out the morning practice. The remaining 11 bench players turned up for a session going over formation strategy and the usual shooting practice. In the afternoon, the rest of the team returned to practice. However, Kaji (who sprained his ankle), Takahara (knee pain), Yanagisawa (knee pain) and Nakamura (bruised leg) remained at the hotel. Everyone except Kaji is expected to be back for today's practice. The doctors have taken xrays of Kaji's foot and no bones seem to be broken though there is a bit of swelling -- they hope to have him start rehabilitation in a few days. The afternoon session consisted of a minigame using a portion of the pitch, followed by shooting practice.